Someone in the creative team thought it would be fantastic to open Wrestlemania XXVIII with an eight second squash match for the world title. If time was the issue, then cutting a patently offensive dance number with Brutus Clay would have sufficied, along with two overblown musical numbers to intro John Cena and The Rock. All the latter caused was a string of booing from the crowd. In reality, all an opening match like that does is kill interest and momentum. Sheamus and Daniel Bryan isn’t a dream match-up, but it’s a core group of current WWE stars that could have worked their way into an energetic technical showcase. It probably didn’t help that the show continued with Randy Orton vs. Kane, a match moving in slow motion to the tune of little crowd investment. Even those who paid to be under the lights in Miami seemed disinterested, the back end of the card -the third act if you will- providing a finish that was entirely Hollywood. Make ’em happy in the end, and they leave feeling as if they witnessed something grand. Don’t take that the wrong way; home and live audiences did see something amazing, enough to block out the first and second acts, just not enough to salvage a droll showing. CM Punk vs Chris Jericho, Undertaker vs HHH, and John Cena vs The Rock brought an A game that was unseen prior. It’s almost as if the mysticism of Wrestelmania has left the mid-carders behind, leaving it up to the top tiered superstars to pick it up. Tradition dictates that the main event isn’t the bright spot of the show. In more recent years, it has dropped onto the shoulders of an aging Undertaker to pick up a languishing showcase and salvage whatever he can. That holds true this year, although it’s a three way tussle. Pro wrestling, at its heart, is storytelling. With or without the mic, it’s about a flow and a pace that keeps the audience riveted, something that ‘Taker, HHH, and Shawn Michaels were amongst the best at. Contained in a cell, whether it was predominantly used or not (it wasn’t), the story was delivered on their faces. You cannot follow a match of that caliber with glossy hype and production values, which the WWE tried with a refreshingly wide lead-up. 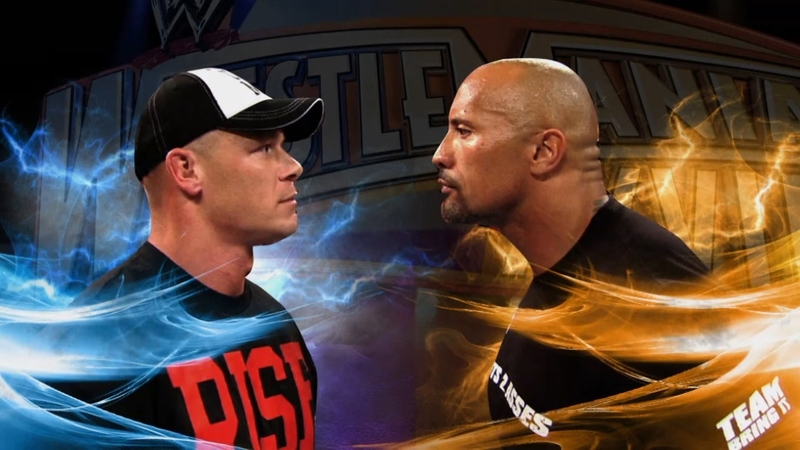 In an era where attention spans demand a new feud every few months, Rock and Cena punished each other verbally for a year. It’s old school WWF, and the glitzy color of the attitudes in that ring bringing about a retro vibe. It’s a grapple fest that could never live up to what was promoted, but came across as something memorable, if only because it probably won’t happen again. Saying it “never” will is like saying Ric Flair is really retiring. In some alternate universe, Wrestlemania is given the visual reverence it deserves. We do not live in that universe. What benefit Blu-ray can offer over cable-based compression makes for an appreciable difference, but one that is still languishing behind other live events such as high-end concerts. The show still looks like an HD cable broadcast, struggling to keep the masses of people in check behind swarming artifacts. The announcers table even proves too complex, the logo for the show revealing overbearing aliasing accentuated with compression. That typical medium shot from the apron of the ring is crushed by a limited digital source. Skin looks oily -obvious jokes aside- as if everyone was painted with a glaze of watercolor paint before they came out. Close-ups, as usual, will produce defined pores, sweat, or the detail of say a tattoo, which is all well and good. Once the camera backs up, all of that disappears into mud. Location, location, location helps out the general appeal. Utilizing a vivid lighting set up that accentuates the event’s core colors makes for a backdrop that doesn’t stop being appealing. There’s plentiful neon to go around. There’s also a side effect with halos. As wrestlers work their way down the ramp, the screen creates rough edges that make the event look sharpened. It’s just one of those odd sight artifacts, nothing ill advised on the part of the WWE. It’s not as if they do much with this AVC encode anyway. Back into the past we go with a compressed Dolby Digital mix that has all the wonders of basic cable. That probably sounds terribly unfair, and it probably is. The video alone takes an extraordinary amount of space, and tied in with a handful of bonus features, space doesn’t allow for uncompressed audio. The only loss are the live musical performances, lacking in fidelity and richness. There is almost no low-end to speak of and lyrics flatten out when let loose from the stadium speakers. For all that is done to mix them into the surrounds, the end result is a track that is routine at best. Bonuses are spread across the dual discs, the first containing a triple threat tag team match that should have opened the show in the first place. The Wrestlemania XXVIII press conference is hilarious to watch, if only for the “press” in attendance sticking out their iPads to capture video. A small retrospective on the Undertaker and HHH completes the first bout of extras. As tradition dictates, the entire Hall of Fame ceremony is included, not the chopped up version show on USA every year. Four segments for WWE Raw that preceded this years Wrestlemania are here too, although sadly not the Rock-appella which turned into the best promo.